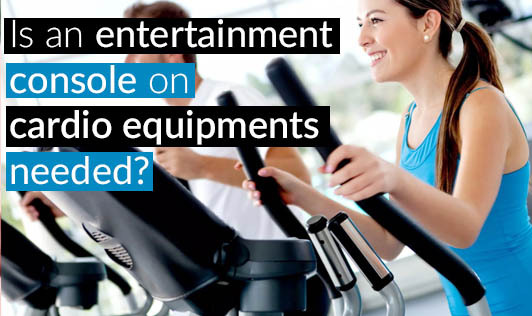 Is an entertainment console on cardio equipments needed? The manufacturers of these machines say that these diversions like TV or music would motivate users and help them use the machine a longer time. According to them it's also about multi tasking with watching news on the TV or listening to the sports update on the radio....because with the busy life multi tasking is the need of the hour. These features will get you through the workout but is that the way it is done is what is interesting? These diversions during workout do kill the boredom but also distracts you. You need to pay attention to a lot of details when exercising like maintaining pace, posture, etc. You also tend to ignore the body's signals to pain or exhaustion. It can be more dangerous as the exerciser might fall off the machine when distracted. These diversions are ok to an extent for casual exercisers but for people looking to maintain certain speed and calorie output it does affect their performance. We suggest you to keep aside some time for exercise and not to mix it with either entertainment or business. After all it deserves a dedicated hour a day.